Flooding the U.S. Congress with petitions, like the one below calling for the abolition of slavery and the slave trade in the District of Columbia (Washington) became a highly visible part of the antislavery campaign in the 1830s. In the 1840s, antislavery groups circulated similar petitions opposing the annexation of Texas and statehood for Florida as measures that would add slave states to the Union. The antislavery agents who traveled throughout the northern states on lecture and organizing tours had blank forms available to distribute. This is a surviving copy that was never filled in. So many petitions related to the explosive topic of slavery were submitted that Congress passed the “gag rule,” which prevented debate on the issue, in 1836. John Quincy Adams, formerly the sixth President of the United States and then representing Massachusetts in the House of Representatives, opposed the gag rule and repeatedly attempted to have the petitions considered and debated. The gag rule did not deter the abolitionists; they continued to collect signatures and present petitions, but it stifled discussion in the House until it was repealed in 1844. In 1850 the slave trade, but not slavery, was abolished in the District of Columbia as part of the Compromise of 1850. YOUR PETITIONERS, Ladies of the town of __________________, in the county of _______________, and state of ________________, beg leave to represent to your honorable body, that the people of the United States have vested in Congress, by the first Article of the Federal Constitution, “exclusive legislation, in all cases whatsoever,” over the District of Columbia. Your Petitioners do not ask your honorable body to legislate for the abolition of slavery in the several states where it exists, but they do respectfully represent that duty to their country, to mankind, and to God, forbids Congress to exercise their power of “exclusive legislation,” to PERPETUATE SLAVERY AND THE SLAVE TRADE in the Capital of the American Republic. The acts of Congress hitherto passed for the government of said District in fact do this. If these laws are ever to be repealed, and slavery and the slave trade in that District are thereby ever to cease, it must be by the action of Congress. Your Petitioners believe that no time can be more favorable for such action than the present. They therefore most respectfully but earnestly entreat your honorable body to pass without delay such laws, as to your wisdom may seem right and proper for the entire abolition of slavery and the slave trade in the District of Colombia. 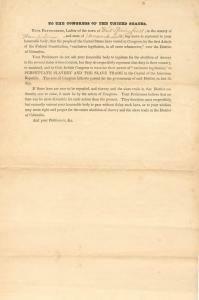 Description: To The Congress of the United States, Petition, ca. 1835, Moore Family Papers.